Working on a vegetable garden is a wonderful and relaxing diversion for many. However, if you are a beginner, getting started can be somewhat intimidating. How to set one up? How big should it be? What and when to plant? Fortunately, Gardener’s Supply Company has made it easy with their planners and “How To’s.” This year, we want to do a series that follows the process from starting a vegetable garden in the Spring, tending it during the Summer, and all the way through to harvesting in the Fall. We chose the Gardener’s Supply “Plant It and Forget It” garden setup, but we may reconsider and go with their “High Yield” garden. We still have a few weeks to decide what plants to get. The supplies we got would work for either one. We got three tomato cages, three vegetable cages, a bean tower, a 3×6 grow bed, and a 5lb bag of organic fertilizer. The tomato and vegetable cages are much stiffer than we expected. They are made of 7mm thick steel rods, quite a bit thicker than the ones you can get at typical gardening centers. Also, these cages are weatherproofed using powder coating instead of plastic. This means they will not peel and should last quite a few seasons. The bean tower is a rectangular design, folds flat, and is over 6′ tall. Its rods are not as thick as the vegetable cages, but are plenty sufficient for supporting bean plants. There are many advantages to gardening in a raised bed: they absorb heat to warm soil early in the season, they help retain moisture all season long, you can control the quality of the soil, and they require less maintenance in general. The sides of the Gardener’s Supply grow beds are made of recycled black plastic. The bed can be assembled quickly and has a generous 10″ depth. The 3′ x 6′ size is large enough for a good yield without being overwhelming, especially in our urban setting. Setting up a raised bed garden also means no digging. This was welcome news to the interns. 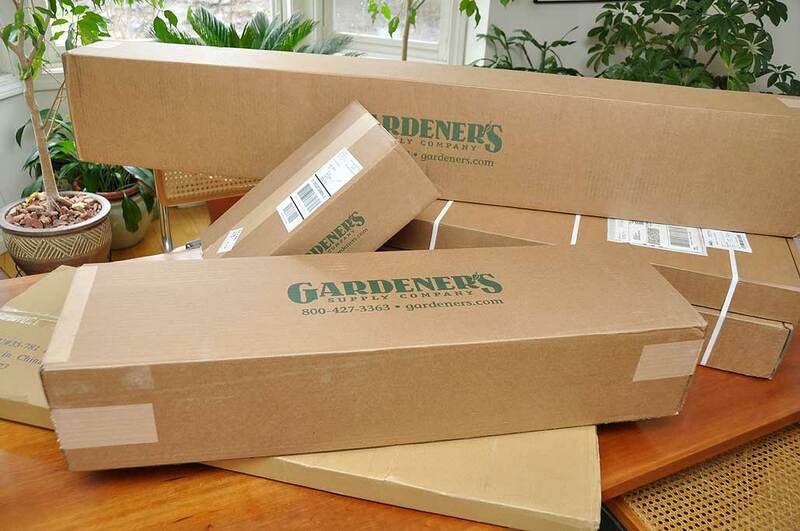 All in all, we are very impressed with the quality of the items from Gardener’s Supply Company. We look forward to getting the garden set up outside and prepped for planting.